On set with Sappho Cosmetics for the 2018 Spring Campaign. Make Up Artist Evelyn Affleck lives and works in Vancouver, British Columbia. 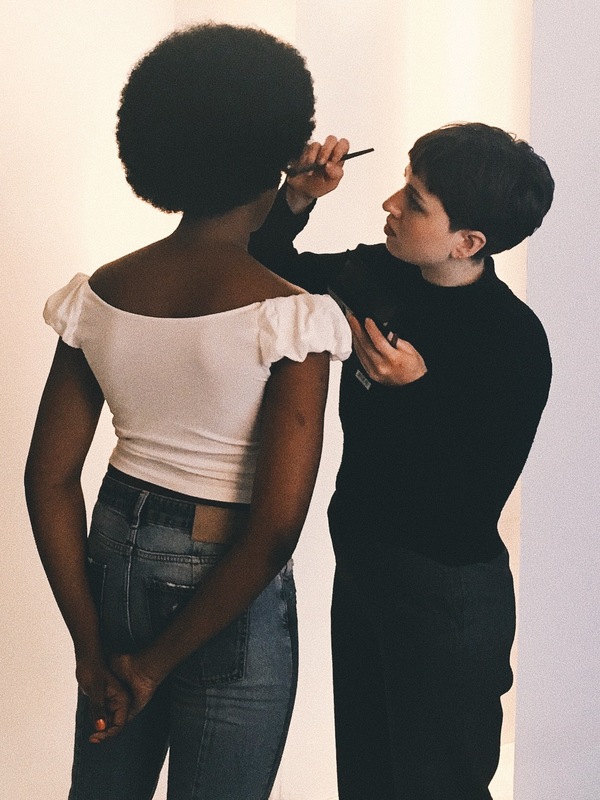 Graduating from Blanche Macdonald in 2015 from the Global Makeup Course, Evelyn now works Freelance Makeup Artist, working in TV, Commercial, and Bridal Makeup. However, her main fields of passion are in Fashion and Abstract Makeup Work, and she collaborates with photographers in Vancouver to churn out fun and creative editorials. On the side, Evelyn is continually uploading creative makeup experiments to her instagram, which has garnered an ever-growing audience. Since Evelyn is from an artistic family, it was always natural for her to explore fine art: music, writing and painting. All these experiences led her to becoming a Make-Up artist. Fine Art also gives her a depth and understanding of what Make Up can truly be, not just pretty surface decoration but an expression of character, story and era.